Members of the Department are united in the goal of maintaining and promoting research and teaching expertise in a broad range of living system functions at the highest possible level. We believe that the whole of physiology is greater than the sum of its individual parts. Historically and presently, the Department has provided an environment in which creative thought leading to major discoveries can occur. The Department has always been strong in the field of reproductive and diabetes-related endocrinology. 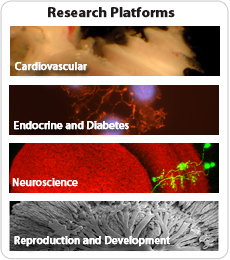 The fields of neuroscience, and cardiovascular, are similarly strong areas within the Department. Research interests represented in the Department have expanded to keep pace with new knowledge. To extend expertise in teaching and research, the Department includes cross-appointed members from other departments and from teaching hospitals. These members contribute knowledge of physiology as applied in medicine, and physiological applications of other basic sciences such as biochemistry, pharmacology, nutrition, biomedical engineering, molecular biology and genetics. The excellence of the faculty is demonstrated by its representation on editorial boards of journals, grant selection panels, and at international symposia; by the fact that all members of the graduate faculty hold research grants; and by the many publications in research journals and books. An excellent and involved faculty sustains the quality of the graduate program. Members of the Department are organized into a four major Research Platforms (see Research And Our People) that function to enhance exchange of information about research interests and which serve to oversee certain aspects of the programs of research trainees. The faculty conduct their research at a number of locations. These include the Medical Sciences Building and in research institutes in nearby teaching hospitals (in particular, the University Health Network, the Hospital for Sick Children, and the Samuel Lunenfeld Research Institute at Mount Sinai Hospital). The Medical Sciences Building is centrally located on the main campus of the University in downtown Toronto, close to all campus buildings including the Libraries and the Athletic Complex, and within walking distance of museums, art galleries, concert halls, and shopping centers.